We have been entertaining house guests for the last few days who have been family friends for over 50 years. For one of them, it’s been nearly 50 years since her last visit to Manila. In the 1960’s, my father was close to several of the American families assigned to Manila at the American Embassy, aid agencies, and other similar postings. My older siblings in particular have remained close to children of these expat families, and over the years we have kept in touch with some of them. It’s our pleasure to be their host for a few days down memory lane (in many cases, buildings, streets and structures they recall no longer exist). We took our guests to the beach overnight, and this is one of the things we fed them for lunch. It was a hit. 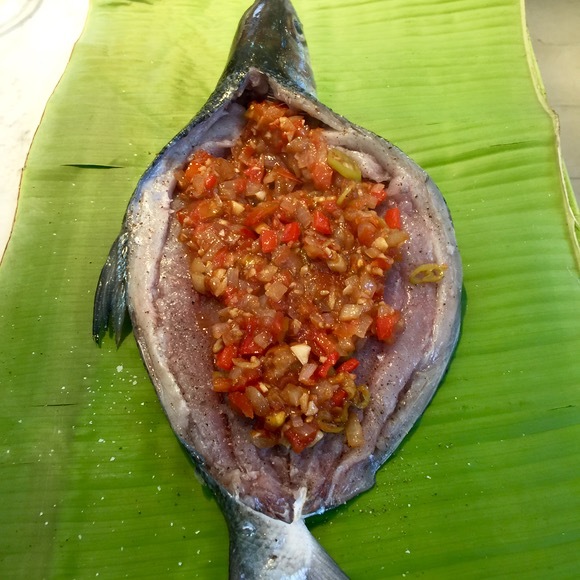 I am not fond of many examples of rellenong bangus or stuffed bangus that turn our dry and tasteless. I have done some myself, here and here and here, to pretty good results. But honestly, the extraction of meat, retention of whole skin, re-stuffing, shown in detail here and here, etc. is a bit of a pain. So this time around, I asked the same lady who prepared this fish the last time to just splay open a medium sized bangus, de-bone it (say 85% of the bones that is) and leave the head on so I could experiment with it. 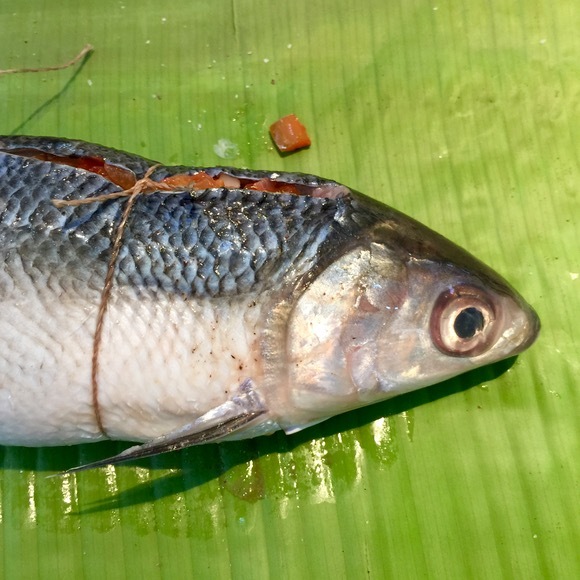 Season the bangus meat with salt and pepper, then add in the stuffing, close this all up and tie it with some butchers twine. 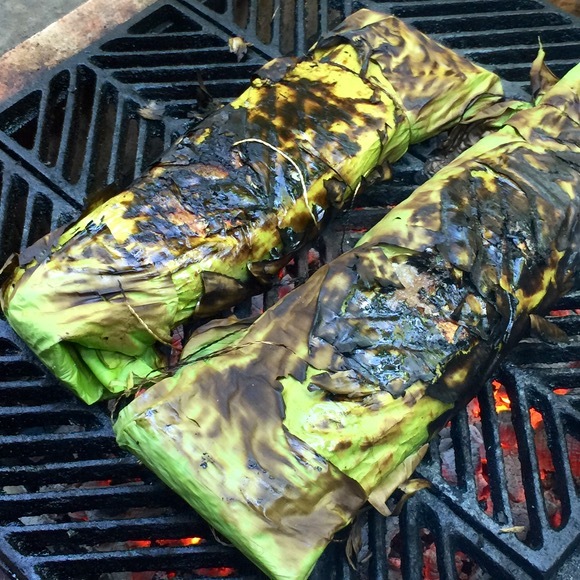 We used abaca twine, but forgot to soak it. Ideally, you need to soak it. :) Drizzle some vegetable oil over the skin of the fish. 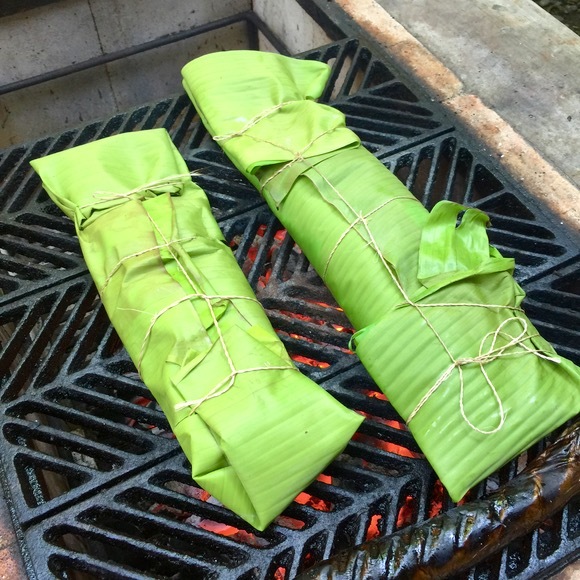 Cover with banana leaves that have been previously heated to make it more malleable, then tie again with twine. Place over a hot fire. And wait for the sizzling sounds from within. If your fire is just right “not burn your eyebrows off hot”, nor “I can keep my hand over the flames for 5 seconds cool” either then one side should take just 5 minutes of so for a medium sized fish. Carefully, repeat carefully flip it over once and cook another 5 minutes or just under that and hope it is just perfectly cooked. We erred on 2 minutes overcooked, so I have adjusted times on this post to reflect what I think would be ideal at this point. Despite the rather dry twine, we didn’t spring a leak and that is the ideal situation. All the moisture remains in the banana blanket and all of the flavor is intact as well. That looks simply divine.. I could have that for breakfast right now. Yum. We’ll have to celebrate Canada Day this way. For someone who grills whole fish often, here’s a grill basket that will reduce the grief involved down to zero. No longer need to piece together various parts of the fish that fell apart in the grill. 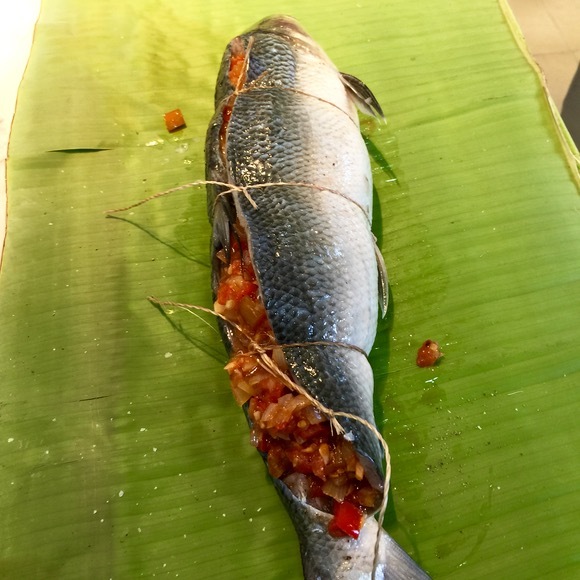 Takes away the need to truss the wrapped fish, only requires a few sheets of banana leaf, just for a bit of flavour and in order to keep the fish skin from sticking to the metal. Why, one can say this is almost indispensable as a dedicated fish pan. Grilled red snapper for Canada Day stuffed with diced onion, tomatoes, chopped chili and cilantro plus a generous grind of black pepper. Used the mixture raw because I want the juice to baste the fish plus salting had already drained away a lot of it. 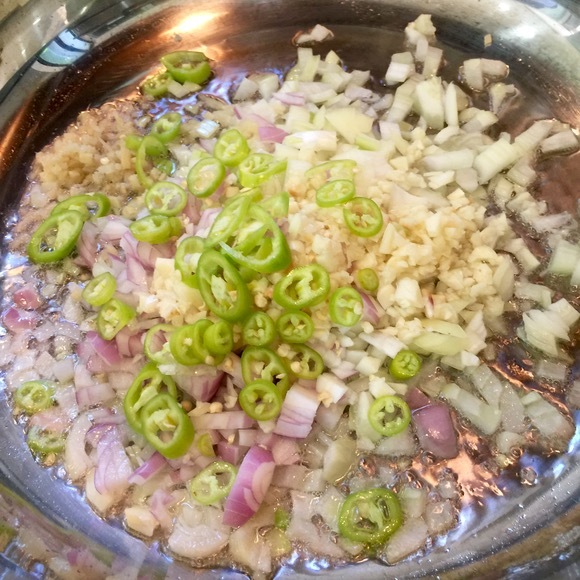 Garlic, of course, comes into play via the vinegar dip. Too late to run out and get salted eggs as Yvette suggested above. Looks like i need to spend some time in the kitchen again. 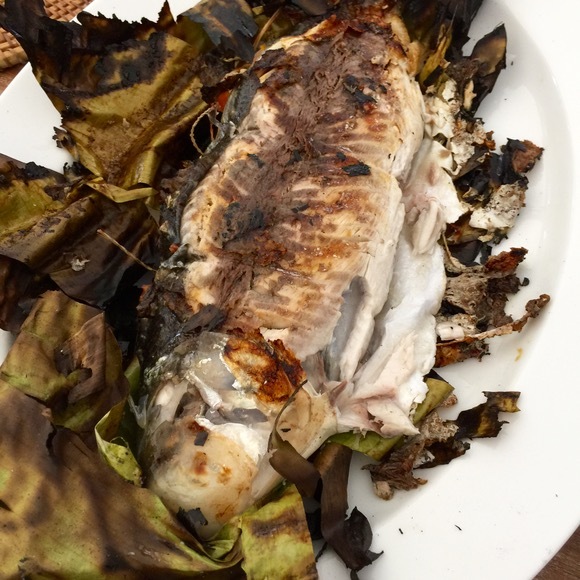 This bangus recipe is quite intruiging. One of my lolas would add slices of kesong puti with the stuffing, her style ata as she was from Laguna and had a supply of freshly made kesong puti.